By Costa Maragos Posted: April 10, 2017 7:00 p.m. 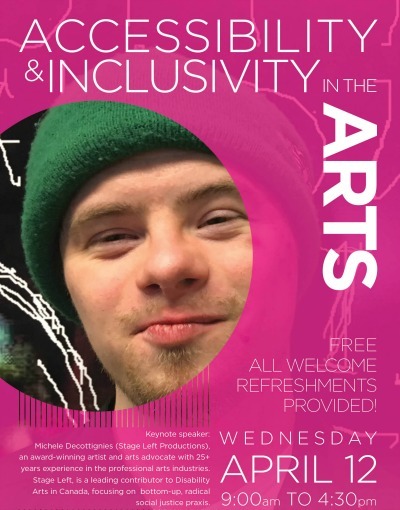 The University of Regina is hosting a day-long symposium April 12 on accessibility and inclusivity in the arts. The event is free and open to the public. The Shu-Box Theatre and RC 176 are the venues for the event. The event will bring together local artists, arts organizations, and the campus community to discuss how institutions can respond to the creative needs of people with disabilities. Irwin has seen first-hand the positive difference inclusivity in the theatre can make for people. For the second year, she is the instructor of the Devising Inclusive Theatre class. 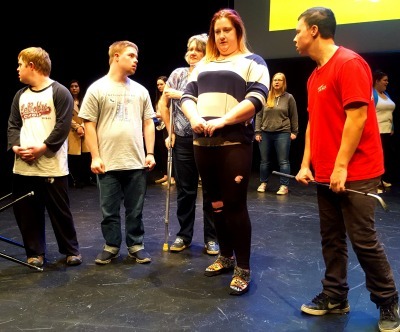 The class has helped change how the institution considers people with disabilities as legitimate performers on the stage. Last year’s performance, Neither Heroes Nor Ordinary People, was first performed in the Shu-Box and was then presented by Listen to Dis Community Arts Organization at the Cathedral Arts Festival and at Regina’s Globe Theatre. This year’s performance, What I know for Sure, is performed in the Shu-box at the conference at noon. “I hope that people will come away with a better understanding of what it means to be a person that lives with disabilities in this world and less afraid to engage with us both professionally and personally,” says Traci Foster, artistic director of Listen to Dis. Foster is completing her BFA at the U of R and is facilitating the acting and directing in the Devising Inclusive Theatre class. The symposium features a keynote speech by Michelle Decottignies, founder and artistic director of Stage Left Productions in Calgary. Decottignies is a professional artist and arts advocate. She founded Stage Left Productions in 2003. The group works with ‘marginalized artists and community groups.’ These include people with physical, cognitive and psychological disabilities, among others. Decottignies’ talk, “From Inclusion to Equity,” will highlight the distinct domain of disability arts in Canada. Other speakers include representatives from the University of Regina and community arts organizations. The day will feature performances by Deaf Crows, Listen to Dis’/ The Other Ordinary and by students from Drama Education. “We have arrived at an important moment in regards to the recognition of disabled artists in Saskatchewan. It has been a long time coming,” says Irwin.